My husband and I have always tried to teach our now almost 7 year old son to appreciate what he has and that there are children who are much less fortunate he and his siblings. For two years, we had him choose a toy at the toy store that he would love to have himself. But rather than keep it, he was to donate the toy to Toys For Tots so that a boy just like him could enjoy the toy on Christmas morning. Last year, Santa included a DonorsChoose.org Giving Card in his stocking, so he could choose a classroom to help. Both charities made our son feel good, but I think donating a toy is something that he can appreciate more because it is more related to his daily life as a 6 year old boy. Back in February of this year, you may recall a project I did with my son to make Allowance Money Cups. Ever since then, my son has put 10% of his allowance into the "Donate" cup. Last week, we asked him to count how much money he had saved in that cup and it turned out he had almost $18. So I asked him if he would like to purchase a toy to donate to Toys For Tots with that money or if he would like to try something else I came across, which was to adopt an angel online from the JCPenney's Angel Giving Tree. He opted for the latter after I explained to him that he would be able to choose a boy his own age to buy clothing or toys for. After we adopted a 7 year old boy in our general area, he shocked me by saying that he would like to buy the boy some clothing rather than a toy. It was all very easy since our Angel's list included the sizes for each type of item. Before I could even navigate to the list of Angel Giving Tree products, my son told me he wanted to buy the boy a Nike shirt. My son is all about Nike. When I told him that, although JCPenney sold Nike shirts for boys, none of these shirts were on the list, he seemed disappointed. He did feel better when I told him that, for the price of one Nike shirt, he could probably buy two of the shirts on the list for this boy. I am so happy that he saw the value in that. 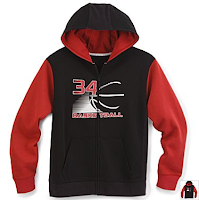 So my son ended up choosing the zip-up hoodie and the long-sleeved thermal t-shirt pictured below to purchase with his own money for this 7 year old boy. Since every child should have at least one cool toy to open on Christmas morning, I added this military rocket hauler playset to our order. Any toy that comes with a 15" missile must be impressive, right? When we were done with our order, we made sure to enter the promotional code and the local Salvation Army Center's address along with the Angel ID in our order information. UPS is generously shipping all Angel Giving Tree gifts free of charge, which makes giving even easier. People can be more generous with their gifts when they do not have to worry about spending money on shipping charges. 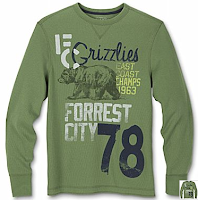 I so wish I could have afforded to purchase everything on this 7 year old boy's wishlist. I do hope that others will also adopt him and fill in the gaps. 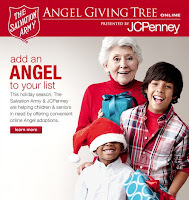 To learn more about this great program, visit Angel.JCPenny.com or JCPenney on Facebook. This program helps both children and seniors in need. The deadline for participating is December 10th, 2010. I was not compensated for sharing this this information with my readers.